After my Snow Globe post, there were lots of questions about my advent calendar, so here some more details about what I do with my family. Having an advent calendar has been one of my most favorite traditions since I was a little girl, so I am always excited to do things with my kids. This year I wanted to find a new calendar, and I bookmarked 547 of them (okay not really, but lots) from the web and pinterest, etc. I had very good intentions of being crafty and making something and in the end I splurged on one I loved from Pottery Barn Kids. First of all, it’s huge. It measures 5 feet tall by 3 feet wide. The entire back is red corduroy, and the front has a 2 inch corduroy border and then a burlap type center. It has batting inside so it feels like a big quilt. 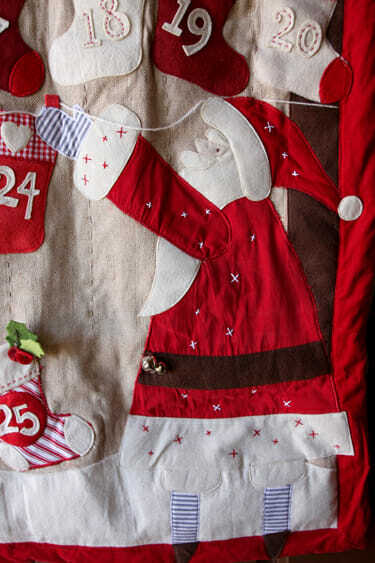 All of the stockings are different, with felt, fabric, and embroidered stitching. They measure about 6 inches tall with the top opening being about 4 inches wide.They’re strung with white yarn that is loose so you can move it around. 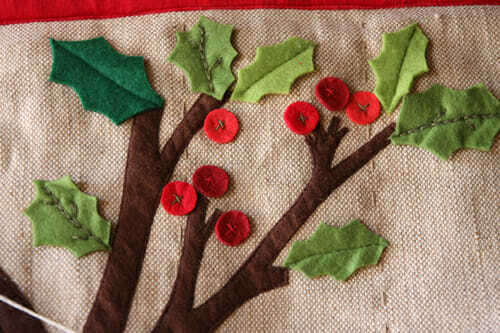 And there are little felt tree, branch, and berry details throughout. If anyone attempts to make one, I want to see a picture! Now, for filling it up. I do a mix of things inside. I like to have some activities, some service oriented things we do for others, and some that are simply for fun. Some involve opening a little gift, others are little riddles written on paper, and others are items that represent an activity. Because the type of activity in each day really depends on my family schedule, I just keep my big master list and fill the actual stockings a few days at a time. One trick is to make a list of the things you’ll be doing anyway during the month, and use those too. Things like a concert at school, or a church Christmas party, or pictures with Santa, etc. Here are the things on my list, and I want to make sure everyone knows that I am realistic enough to know that we will not do all of these things, or even these types of things every day! December (and life in general) is busy, so I have little bags of treats and trinkets to slip in when I just need a little prize in there. The trick is having things organized so you have options. *Start a Lego count down (actual day #1 since we did snow globes early. More about this below) Lego advent wrapped under tree. *Get trapped in a snow globe! 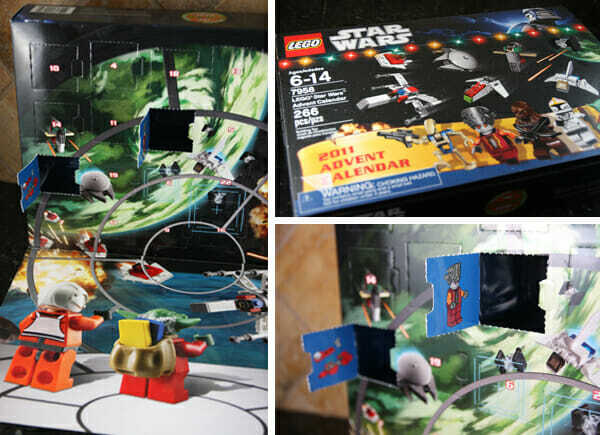 Lastly, if you have Lego fans at your house, we LOVE the Lego advent calendars. They make them in several different themes. At our house we’re all about Lego Star Wars. Each day you open a window and there is a tiny little Lego set in there. On the inside of the door is the instructions. Some our little things like ships, and others are Lego guys. 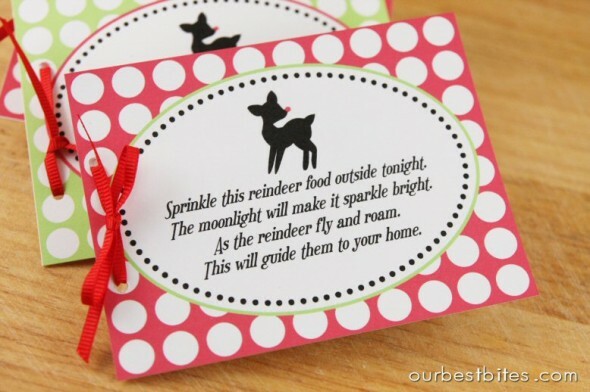 Oh, and last year we started the tradition of sprinkling Reindeer Food on Christmas Eve. *LOVE* this one. Okay, this post turned out much longer than I anticipated! Now it’s your turn! If you have fun ideas, or have made an advent calendar you love, feel free to link up in the comments! I’d also love to hear about any great holiday traditions you think other people might enjoy starting in their homes. I’d love to hear all of your fun ideas, so please share! I did a copy of a Halloween PBkids calendar a couple of years ago. It was so time-consuming and detail-oriented, but the final product is much more durable than the original. Worth it if you have oodles of time! BTW- the one you have is absolutely adorable!!! When my kids were little, many years ago, some friends and I got together and created a felt nativity advent calendar. There was a different member/item of the nativity to put up on the calendar each day until Christmas. There was a scripture that went along with each item. Of course baby Jesus was the last thing added to the manager scene. Leigh Anne–will you share a picture of your advent calendar on your blog? I have been wanting to make a nativity one and I’d love to see yours! What a darling advent calendar. I have mine half way done so it will have to wait until next year. No young children in the house but I still enjoy doing it. We actually have a birthday party for Christ’s birthday on Christmas. It is a full on birthday party complete with cake, balloons, party hats, and presents for Jesus. My kids love it. I can’t wait to start doing a daily activity with them to celebrate the season. Thanks! Ohhh, I love the book idea! My mil has given us so many advent items over the year I just stick with the easier ones, but I think we’ll add the book wrapping one to our list!! I have lots of Christmas books – I always buy them on after Christmas clearances!! Thanks for the great ideas and delicious recipes! Awesome! I still don’t have an advent calendar yet. Shhhh!! I thought it was adorable, and could be good for adults and children alike. We don’t really have any christmas traditions in place yet. My husband and I have only been together 3 years and our son is only 2, so we’ve been piggy-backing on our parents’ traditions so far. Once we have a bigger place (hopefully sooner than later), I’m sure I’ll start going nuts with the decorating again. Right now our only real tradition (that is truly our own) is spending a couple days baking and then handing out tins of cookies around the neighborhood. Last year all our son contributed was a couple handprints in the shortbread. This year I’m sure he’ll have more fun with it. The button tree would be fun decorating with buttons collected during the year from trips or other reasons. Oh my goodness, I didn’t know The Jolly Postman books were still being published! They were some of my favorite books as a kid 🙂 Also, what a great advent calendar. I love the mix of activities for the family you have, especially the ones that involve your kids in serving the community! We also listen to the Nativity story on a Hallmark Advent ornament. Oh thank you for sharing the details, ideas, and close up pictures! I saw the Lego advent calendar at the store the other day and thought it was way too cool. And I am so forwarding this post on to my sister because she was looking for good advent calendar activity ideas. PS the Christmas book idea is a favorite of mine too! Mine is not as fancy…this year I made it out of poster board and bought a couple bags of holiday kisses. Each child has 31 (this year- because we start the day after Thanksgiving) kisses in a row. Now in order to get their kiss at the end of the day, they have to do the good deed assigned. I make a big bowl of deeds, like no crying, no screaming, smile all day, do it the first time, and each night we pick the deed for the next day. The kids love it! Last year I just did it with stickers and if they filled up the whole chart they got a medium sized prize. I don’t really let my kids at candy during the week so I think they really enjoy their little treat each evening. I’m a big nerd and like to make it each year and kids kids help me come up with the deeds, my son loves to come up with deeds that are easy for him, but hard for the girls. Now my girls are getting bigger though and well it’s payback time. Today’s deed was tell people you love them AND (my husband added this) give mom and dad kisses and hugs when ever we ask! Love it! My grandson, Caleb, has that exact Star Wars Lego advent calendar. He is so super excited about it! Maybe I’ll get adventurous and make four of the advent calendars- one for each of my grown children’s family. I got tired of wrapping 24 books, too (plus we have over 50 Christmas books!) so I printed off small pictures of their covers and put those in our advent calendar pockets (you can usually find the image on Amazon). Now my girls find the book that matches the picture and we read it! We have lots of traditions: we live close to a lake and love the ducks, so we wait till it gets good and dark (usually late also) and take our duck friends a gift (duck feed). I always get each child a new ornament with their name and date on it (they’ll have lots when they move to their own home…and hopefully good memories to go along) and always Christmas pjs. Our calendar was printed from a paper toy website that has lots of adorable free paper toys. (I’ll find the web if someone wants it) but I’ll be working on something a little more fancy for next year….but will always do the paper one also, my kids love gluing on the paper ornaments! And we watch a Christmas movie every week in December. FUN FUN FUN! Always a service project too! Merry Christmas all!!!! My favorite Christmas tradition of ours is…on Christmas morning the kids aren’t allowed to come upstairs until we tell them they can (they’re older now and we’re usually waiting on them!) Then they get to see what’s in their stockings while we are waiting on breakfast to come out of the oven (oven baked french toast that I make the night before) All the presents are divided into groups for each family member, but they aren’t sorted by who they are TO, they are sorted by who they are FROM. The youngest GIVES first. Then we go by age. Even though they are 16 and 12 now, they still have a blast being able to GIVE their gifts, (and of course they have fun trying to make the other wait as many rounds as possible!) We live far away from our families and always ship gifts out way before Christmas, so it doesn’t always feel like they are giving anything, but this helps to keep the giving spirit in Christmas. Sooo super cute. I love all your ideas! Thanks for sharing! I just finished my Pottery Barn inspired advent. (different one than yours). Here’s the link. It was sooo much work! never again! Such a great idea! 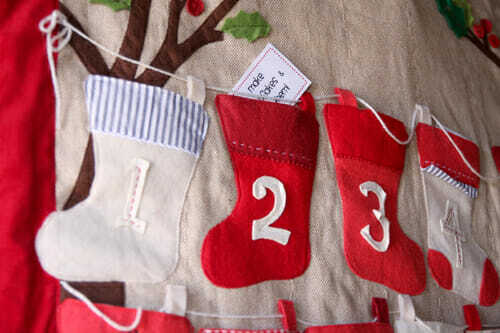 I think I’m going to be adventurous and try to make the stocking advent, but the mailbox is a cute idea to give away as gifts! Hmmm, it may be a busy weekend afterall. We have our first grandchild, in whose care we participate. She is too young this year. I am collecting ideas for next year. I have always put out our collection of Christmas books as decoration; but again next year they will be put back into use. (When older, I was thinking of finding a chapter book to read during the season.) Also, I am going to try to collect 25 CDs of Christmas music by different artists. Another thing I want to do is Pottery Barn inspired advent calendar (last year’s design) utilizing sticks, strings and pails. Another thing I would like to do is continue the season with the 12 days of Christmas that start on Christmas day. I love the elf on a shelf idea!! I’m going to try to do it with my kids this year? I would love to hear any cute ideas of where you find your elfs! Target has “The Elf on the Shelf” that comes with a book and h Elf on sale this week! It is super cute. Hallmark carries it, too, or you can order it on Amazon. One of our favorite traditions!! Thanks for the better picture of the advent calendar!! I have been wanting to make one, but I will not get around to it till next year (I’ve got three boys, 3 1/2, 2 1/2, and 8m). I took the easy way out this year and got a basic countdown from Target for $5. We are also going to start the elf on a shelf this year, my husband found a cute elf online that has velcro on the hands so we can hang him from things! 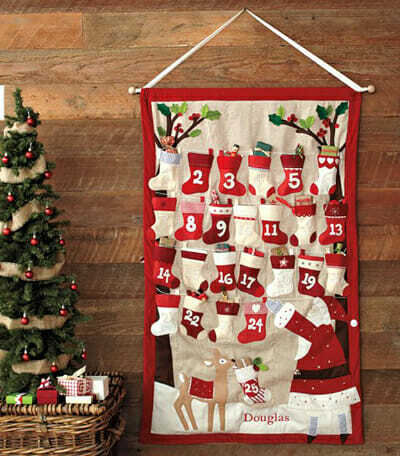 That is an adorable advent calendar! We have done the book advent for a few years now. We only have a couple of Christmas books, but I like to get them from the library. I reserve 24 of them online and wrap them up and put them in a basket under the tree. I like that we can get our old favorites and find new ones from the library. That is as ambitious as I’m getting this year for advent calendars. I find myself overwhelmed when I try to get too fancy. I do the book countdown without wrapping them. they just look cute in the basket. We have an advent wreath, a tradition that I think is a little out of fasion maybe, but 4 Sundays before Christmas we light a candle and read a scripture about Jesus Christ before dinner. I did a little on-line search a few years ago to try and incorporate our dutch and scandinavian heritage into our Christmas, so we celebrate Sinterklaas on Dec. 5 and St. Lucia on Dec. 13. usually just with cookies or something special for dinner, like swedish meatballs. My belief is if I keep it simple, I get it done! I love this! I do something similar. Mine is just a little wooden box that has 25 small doors. In each door will be a slip with something that we will do as a family. A few of my favorites that you didn’t have are sleeping under the Christmas tree (we did it last night and was so fun), eating dinner by candlelight, “Gadianton Givers” (we get together with friends and take goodies to members of the ward secretly), and clean out old toys and donate. Thanks for your ideas. I have added a few to mine. What a great idea! We always did candy for the first 24 days and then had a family gift on Christmas, but I love the idea of activities throughout the month! Love all these ideas! Think I’ll work on the advent calendar for my 22 year old baby during the next year. Thanks for the great idea! Love all your ideas! So so cute! What were the other books in your basket that you read to your kids? I want to start a good collection…thank you so much! Merry Christmas! Oh my goodness! I love Santa’s legs sticking out under his coat! 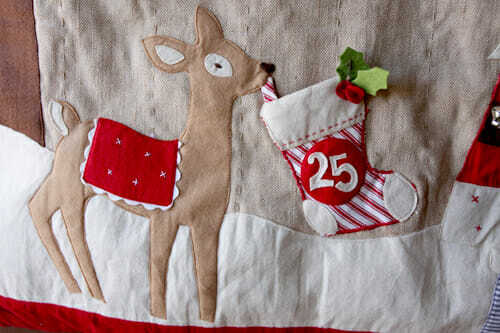 That advent calendar is on of the cutest I’ve ever seen. I just might try making it. Thanks for showing off the details! We do the books under the tree as well, and we just checked out some from the library to get us up to 25! Thanks for inspiring us in so many ways!! Love your ideas!! My boys are Lego Stars Wars LOVERS!! I’ve never seen the advent…. where can you purchase them? I’d love to do one this year…. or next! Or both! Love your website and recipes, I often find things that I love here and come to seek inspiration for dinner, holidays, etc. Love it! That pottery barn calendar is adorable. I’m sad that it’s not available anymore. I am not crafty enough to make one-could you share links for a few of the other ones you were thinking about buying? I am having trouble finding any cute ones to purchase. Thanks! You mentioned ‘You Are My Miracle’. I hadn’t heard of this one, but last year my husband bought ‘You Are My I Love You’ by the same author for my 2 year old daughter. I cried and cried when we read it on Christmas morning. I had postpartum depression (have it again with baby #2), and it was just such a heartbreaking book to read, when you struggle with loving your kids. It is my favourite book because it reminds me that I DO love my kids even if I don’t always feel like I do. Thanks for mentioning this book – I’ve added it to my wish list. This will be my husband and I’s first Christmas together. Growing up, on Christmas Eve, our family would attend our church’s service and then we’d drive around to look at lights. My husband and I plan to continue that tradition this year 🙂 We’ve already put up our first tree and made a gingerbread house! 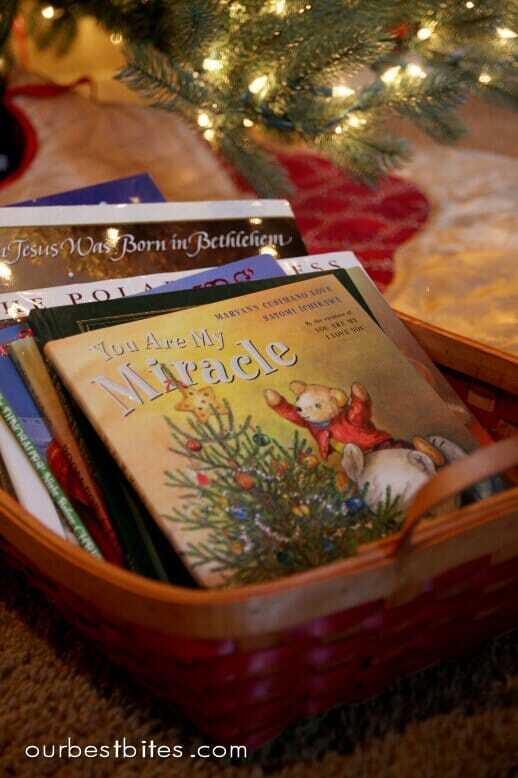 Last year, my mother-in-law gave us a copy of the advent book their ward created many years ago. It is a binder that has a compilation of scriptures, stories, songs, etc. for each day of December. This year, we created a Christmas countdown using our favorite candy to go along with what we read in the book each night. It is really getting us in the Christmas spirit! I love this idea & made an advent calender a couple years ago that we love. It was very easy, I sewed toilet paper tubes inside fabric to hold the papers. It looks more like a scroll, kinda hard to describe but cute & very easy to make. I started making one tonight…can you tell me what the back looks like? I guess what I’m wondering is if they sewed everything on the burlap first before the batting and the backing, or if they sewed the burlap, batting and burlap together, then sewed on the reindeer, stockings and santa?? Does my question even make sense? I’m just cutting everything out and trying to figure out how to get all the layers right. When i was young, when we put the cookies out for Santa (which later changed to McDonalds cheeseburgers lol), we also put carrots out for the reindeer. I was always very excited to see them chewed down to the nubs. Ahh, memories. Thanks for sharing all of your calendar ideas — I want to get organized next year and do this but didn’t think I could come up with 25 ideas! Thanks — you’re awesome! Merry Christmas! I saw this and decided I had to have it for our family. I searched it down on eBay and we’ve been really enjoying it! I am curious, what do you have in mind for Christmas day? Will it be from you or Santa? I love your calendar! It is soo cute! I like the idea that it is soo big and the stockings are big enough to put things in. 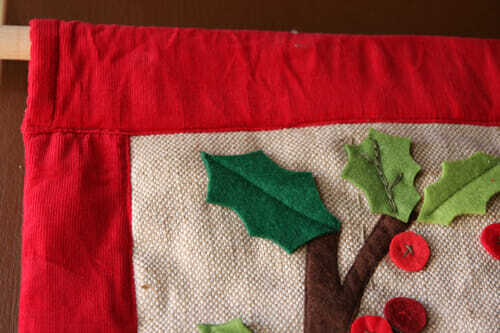 I might try to make this, of course it would have to be for next Christmas! 🙂 I did find this turtorial online that I thought might be of interest to anyone trying to attempt this one! I’d LOVE to attempt a “knock-off” of this! Any chance I can get a close up of stocking #1? I’d like to see how they sewed it since it’s part fabric, part felt, and how they attached the stocking loops (that the yarn goes through). I’ve made a Stuffed Advent Calendar Tree but I love your ideas . Would like to link it to my Squidoo Lens . Thanks for sharing . Thank you for making my Christmas easier! I have been searching for more ideas for our Advent train (found at Target a few years ago) I slip pieces of paper in with activities a lot like some you have listed but I always need new ideas to refresh my memory and also to have some NEW ideas! I have pinned this and will be coming back to it when making my little slips of paper…..
It’s taken me a year, but here is mine. At first I was trying to copy it exactly. But a friend convinced me to do what I like, so I changed it up a bit. Hope you like it. PS-the money you paid for your was definitely worth it!!!!! Your post has inspired me to enjoy the season with my girls and not get caught up in “getting it all done in time.” I love the idea of adding activities and books to the advent line up. I’m almost forty and I just got that the Christmas holiday is not just one day, but a month long celebration. A tradition that my little guy loves is a month long activity during December. Prior to December first I take a 100 (started out with smaller sizes) piece Christmas puzzle and assemble and then I disassemble in a certain order and separate into 24 equal piles and keep them in a certain order for wrapping and labeling. (The order allows my son to put the puzzle together as he unwraps each pile of pieces.) I then wrap each pile of pieces and label with a number of a day of December. For example, the first packet are the first four pieces of the border of the puzzle and I label it with a 1. He then knows that’s the one we open on December first and assemble. Then on Christmas Eve he opens the last packet and completes the puzzle! He loves the challenge of putting the puzzle together and trying to guess what the picture is going to be. One fun tip – I take a picture every night the pieces are added and at the end of the puzzle I use an app to setup a stop motion “film” that shows how the puzzle progressed – great digital memory!! Also, another tip is I use a large piece of cardboard wrapped in plain wrapping paper to assemble the puzzle on – as I can’t give up my one large table for a whole month. We then slide the cardboard under our couch and take out every night!